The project site is in Yizhuang, southern Beijing, where the royal establishment of the Jin, Yuan, Ming and Qing dynasties were located. 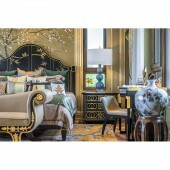 The space design takes root in cultural heritages to create permanent residences with imposing imperial magnificence. Serenity and extravagance that characterize the ancient capital are brought into play in the creation. Interplay of dynamic and static forms are balanced and unified by an underlying unpretentiousness. The project consists of 128 imperial court style villas. The architectural floor plan reinterprets a neighborhood system, walled courtyard house, of the Tang dynasty and famed imperial Qianlong Garden, a courtyard house layout. Laid out in a letter I shape, the villa enjoys layered private spaces from the wide gate through alleyways to the yards. Classical Chinoiserie composition featuring the backyard nestling behind the front yard provides both prestige living and complete privacy. The dining room is relocated from the ground floor to basement, allowing the ground floor space to function as both salon and mistress living room. High ceiling in basement channels light from windows above into the basement creates a luminous environment perfect for special occasions. Materials used come in a great variety and highlight the layered structures, interplay of metals such as brass and bronze. Elements of classism and modernism are balanced through contrast between strength and lightness, bringing into play natural textures of the objects. 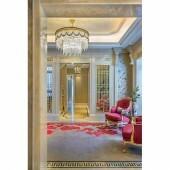 The flooring tiles, for instance, featuring various jadeite, white jade and topaz, symbolize the noble virtue with its quiet and mild texture. The color scheme gives prominence to brightness accentuated by pale tints. 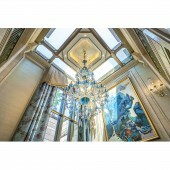 At the beginning, the client required the show flat to represent cultures of Beijing and to integrate regal features with classic Chinese flavor. However, the real estate market already offered a plethora of villa models featuring traditional Chinese style. In order to differentiate this project from others, we explored the unprecedented new theme featuring the Republican period. Dispersed locations of elevator and stairway create repeated circulation routes on each floor that always bypass shared public space, which significantly undermines independence and integrity of each individual section. After adjustment, the circulation cores of the elevator and stairs are packed together to form a compact and orderly layout. 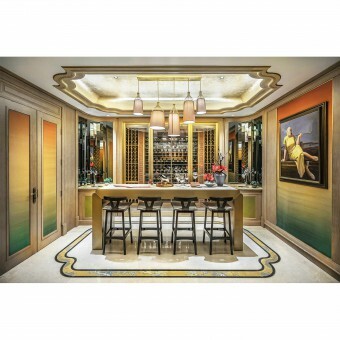 Tang Villa a Show Home by David Chang is a Nominee in Luxury Design Category. Tang Villa a Show Home by David Chang is Winner in Luxury Design Category, 2017 - 2018. Did you like David Chang's Luxury Design? Did you like Tang Villa a Show Home? Help us create a global awareness for good luxury design worldwide. 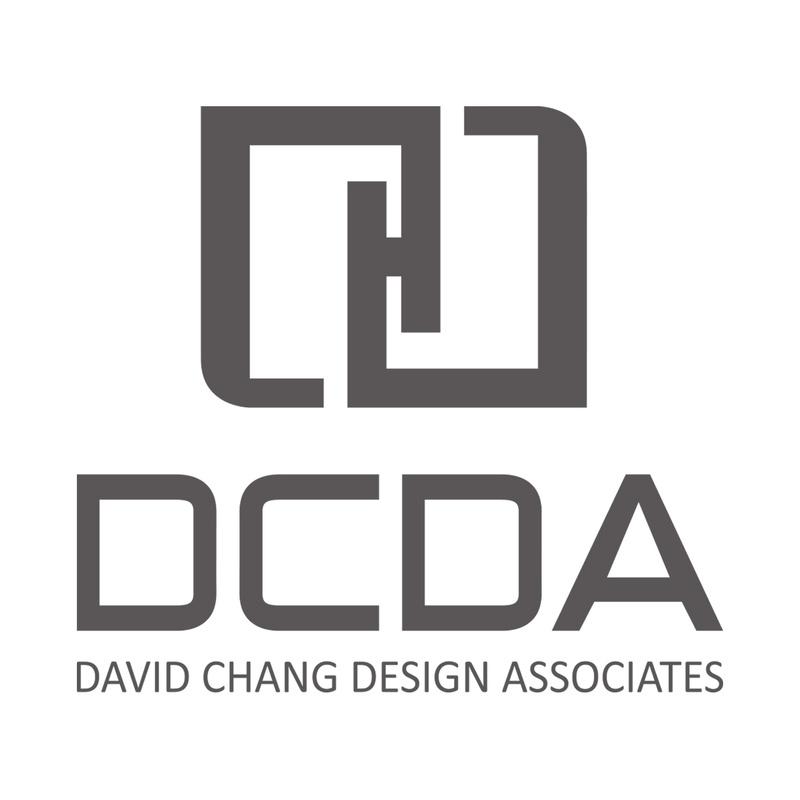 Show your support for David Chang, the creator of great luxury design by gifting them a nomination ticket so that we could promote more of their great luxury designs.